Maya Plant Use: Medicine, ornamental or product use. The flowers have been used as an astringent while the roots have been used for digestive and respiratory ailments. Hibiscus is also used as a black dye and for a pleasing tasting tea. (Dobelis, 1990). The plant has also been used for a wide array of female ailments from excessive menstrual flow, and painful menstruation, to the prevention of miscarriages. The leaves and flowers can also be used for skin conditions and headaches (Arvigo and Balick, 1998). 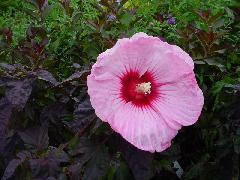 Botanical Significance: The hibiscus flower was mostly likely honored for its beauty. The pronounced pistil has been emphasized in ancient Maya depictions of this plant. Could the female parts of this flower have played a part in the meaning to the ancient Maya? Pregnancy and child birth may have been the focus.